My writing partner and dear friend Mary DeRosa Hughes welcomes Emmy into our film family. In the early morning hours of July 14th, 2003 I was at my neighborhood bar enjoying the company of my friends who happen to work at the happiest place on earth. They just got off their shift at the park and per our weekly custom we enjoyed a late night meal with some refreshments. Ginnie, one of the park's art directors and one of my biggest fans (no kidding, i actually have a fan) asked me whatever happened to my Emmy submission for 2002 best cinematography on the feature documentary AMARGOSA (Sundance Channel). About thirty minutes before lightning struck. Executive producer Traci Robinson, the cinematographer, director Todd Robinson, and producer Sidney Sherman. Those of you who are filmmakers know how expensive it is to submit your films to the various film festivals around the world. Well, the Emmy's are significantly more. My category for best cinematography ran me $165 to submit. If you do the math and count up all the potential craft's people on a given television program you can see how $165 per submission can end up costing the producers about week's worth of catering. So when my producer said if I would like to be considered for an Emmy the deal was I had to pay for my submission. To be honest, I considered not submitting because I felt it would be as if I walked across the street, withdrew $165 bucks from the ATM, and threw it in the air. But how often does a opportunity come along to be considered for a pretty cool honor? I wrote the check and mailed it off not thinking anything would come of it. The Emmy Team. Producer Sidney Sherman, the cinematographer, and director Todd Robinson. Flash forward to 3:15 am on July 14th with me sitting in front of my computer at home. Remembering Ginnie's prodding, I fired up the computer and did a Google search - 2002 Emmy Cinematography Nominees. Within seconds the NATAS press release announcing the 2002 Emmy nominees popped up as the first search result. It was time stamped 6:00 am, New York - literally just 15 minutes before I typed in my search. Bringing Emmy back to our table to celebrate with my best friends who traveled all the way to NYC. You gotta keep the faith. JB Burtin, Mary DeRosa Hughes, the cinematographer, and Rose Burtin. I was sitting in my underwear scrolling down through the categories. My heart was racing with my hand trying to keep the mouse under control as I got closer to my category - Outstanding Achievement in a Craft, Cinematography. My eyes blinked. There staring in my face was my name listed among six or so others. I jumped out of my chair not knowing what to do. It was 3:20 in the morning, too early to call anyone and share the news. So i just sat there, holding my forehead trying to take in what this meant. How random. An hour earlier Ginnie asks me an obscure question. God has a funny way of getting my attention. Sharing Emmy’s love with producer Kenneth A Carlson and our executive producer Traci Robinson. 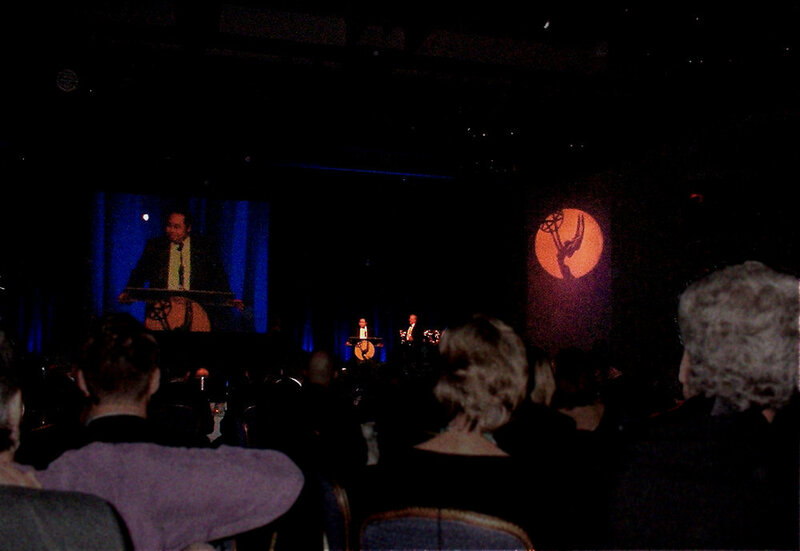 The 2003 national NEWS / DOCUMENTARY EMMY'S were held in New York at the Marriott Marquis, Time Square. The awards are for the 2002 television season so the event was held a year or so after AMARGOSA aired on The Sundance Channel. Sitting in the ballroom of the Marriott Marquis, the vibe was electric. The Emmy statues were all lined up on a tiered table on stage that glowed like The Holy Grail. The round tables in the hall were arranged to seat the larger networks up front (CBS, ABC, NBC, PBS, FOX) working the their way back to the obscure channels. We were seated in the last row. Upon returning with Emmy to The Muse (our hotel), Mary had a great idea of taking Emmy on a walk of victory around Times Square. So we changed out of our formal attire and into our victory clothes and spent the next couple of hours sharing Emmy with her fans. I bought a tuxedo instead of renting one because i wanted a memento of the evening because there was zero chance of me coming home with the golden girl. I thought how depressing it would have been returning the tux knowing it was going to be worn next at a prom by a pimple faced kid or being splashed with beer by a drunk wedding crasher. So my tux would be my trophy which now drove the cost of my submission to over $400 not including hotel and airfare. This Hollywood thing is getting expensive. The very first folks to take a victory tour photo with Emmy was two of New York’s finest. This was the beginning of my version of the Stanley Cup Tour. My producer Sidney Sherman said there would be some extra seats at our table because nobody from the Sundance Channel would be attending. I guess they believed the three block walk from their offices down to the Marriott Marquis would not be fruitful which helped confirm my decision to buy the tux. So i was blessed to have Sidney encourage me to invite my friends to share in this special event. One of my best friends, JB and his wife Rose, were two of my guests. I had one seat left so it was a no brainer. Mary my writing partner and longtime friend was my choice to sit next to me. I needed someone who could help me maintain my cool when my name was not announced and she has kept me in check during some humbling moments over the years. The Marriott Marquis in Times Square is the venue for the annual News/Documentary Emmy’s. I have elected to stay only at Marriott properties ever since. So there we were. Director Todd Robinson who gave me my break in the business sat to my right with Mary to my left. On Mary's flank was JB & Rose. Also at our table was producer Sidney Sherman and his wife along with producer Kenneth Carlson. Traci Robinson, executive producer and I think one of Ken's friends and maybe another couple completed the seating arrangements. As luck would have it my category was the second or third of the evening. The legendary journalist Bill Moyers was presenting my category so when he stepped up to the podium and warned the nominees that there are a few tricky steps that have to be navigated in order to get up to the stage, i was relieved to have worn my contacts. Yes, my vanity would not permit me to wear glasses that night. The title of our film is AMARGOSA. One of the other nominees in my category was from a film with the title ANSEL ADAMS. You can imagine what happened next. Bill Moyers starts announcing the winner "the Emmy for cinematography goes to ANSEL ADAMS..." At least that is what I heard. The rest of the people in the hall heard AMARGOSA, cinematographer CURT APDUHAN. Todd jumps out of his seat leading the explosion that rocked the Marriott's ballroom. Actually, one table in the back row was where the explosion took place. We may be a small network but we were mighty that night. I sat dumbfounded for what seemed like an eternity. Todd finally grabbed my arm yelling "Get up there!". I turned to Mary and she was going crazy. JB and Rose were doing turns around their chairs. Ken and his friend were going nuts as well. Sidney and his wife were celebrating mightily. It was unreal. As I rose out of my chair Todd hugged me tight catching my right eye with his shoulder. Out popped my contact. So much for those tricky stairs. As I made my way from the back row to the stage people were clapping and mouthing congratulations. I was desperately trying to press my contact back into position since Todd's bear hug actually pushed the lens up into my eyelid cavity. My eyes started to water and a woman pointed to me and said "Look, he's crying" while clasping her hands to her heart. I yelled back, "No, I'm not crying!". Pride has no bounds. This was a very special moment for me. The tragedy of September 11th happened only two short years before the night of our Emmy celebration. We were walking on our tour and came across Battalion 9, Ladder 4, Engine 54. These American heroes lost several of their brothers when the World Trade Center collapsed. I was honored to be able to take a photo with these two Patriots. As I approached the stairs Bill Moyers was smiling down on me. I kept telling myself step and lift. He pointed to the two steps that were definitely a bit odd waving me over to a safer purchase. I made my way up without falling to be welcomed by Bill. He reached out to me and place his hand on my lower back, guiding me to the podium. He looked directly into my eyes and said "Well deserved, the moment is yours". And with that he spun me around and my hands grasped the podium. I scanned the audience for a brief moment making eye contact with Diane Sawyer. Diane was clapping and smiling while mouthing "Congratulations". I was smitten. On the other side of the scale I ran across The Naked Cowboy, Time’s Square’s pop culture icon. He was very cool and didn’t charge me for the photo! I only remember the first few words of my acceptance speech. "Well, this is a surprise" I said and the audience actually laughed. I think it was definitely a surprise to the big networks and even a bigger surprise to folks at the Sundance Channel the next day when I brought Emmy to their offices for a meet and greet. The president of the Sundance Channel told me our Emmy was the first one the network had won. He actually called Robert Redford wanting me to talk to him but he was not available. I think he was shooting that day - or making breakfast. Wrapping up our time in New York, Mary and I took one last photo in front of the Marriott Marquis and called our driver to take us to the airport. Mary headed back to Scottsdale and I jumped on a Jet Blue flight back to Long Beach. When I was going through the TSA checkpoint the officer scanning the carry on luggage stopped and asked who won the Emmy. I identified myself and a loud cheer erupted from the security que. Unfortunately no photos are allowed to be taken at TSA checkpoints but I can assure you Emmy got a lot of attention and a very nice NYC send off. If any of you have had a delivery of Omaha Steaks to your home you will know how I brought Emmy back to California. After escorting me from the stage to take the official photo, my handler (think stage manager) asked "Will you be shipping Emmy home?". Todd prepared me for this since he won a prime time Emmy of his own. He told me to take her on the plane with me because shipping Emmy would wind up with a high probability of a broken wing or two. Thinking back on that night in September I can hardly believe it happened. I know many industry folks have won multiple Emmy’s over their career. But for me this one is just fine. It memorialized a great group of filmmakers coming together to collaborate on creating a film that was indeed special. The Emmy recognizes the efforts of everyone who was involved with supporting Todd Robinson’s vision and Traci Robinson’s passion. Without the unbending will of Sidney Sherman and the contributions of some very talented crew members, the story of Marta Beckett and her beloved AMARGOSA Opera House would have been a dust devil blowing in the desert, disappearing into the sands of time. So I said I'll be escorting the golden girl home on the plane. I was then directed to a table filled with rectangular styrofoam boxes that looked liked they were used to ship lobsters in dry ice - guarded by two burly academy reps. I think the word got about the shipping option. When the official opened up my box there was a perfectly molded space for Emmy to rest. It was a mini Emmy coffin. To this day I don't remember how I got that styrofoam box back to my hotel room because I took Emmy directly from the ballroom to the lounge atop the Marriott Marquis and proceeded to share the joy of the evening while the fog rolled in over the city. All I know I had Emmy resting comfortably in her custom molded coffin when the TSA agent spotted my lobster box and made me open it up. The moment mirrored the scene in PULP FICTION when Jules opened up the briefcase in the Hawthorne Grill. First thing he did when he saw her was to ask "Is that real?". The second thing he asked was "Can I hold it". The last thing he said was "Man, its heavier than I thought". Sharing Emmy with my family. Love you Mom and Dad. If you are still reading this I would like to thank you for your interest. I have not thought about that night for quite a while and writing this has been a joy in remembering how special and blessed all of us are to be able to earn a living doing something we love. When I guest lecture and mentor at our local high school media arts program I am always asked to bring Emmy along to share with the kids. Most students find her interesting from seeing her on TV. But there are always a few kids who get emotional when they hold Emmy. For those kids I find time to encourage them to follow their dreams. But I also give them a healthy dose of reality that they must first do the work and earn the respect of their collaborators. Emmy is the result of a team of passionate crafts people working for the right reasons for a common goal. God is constantly reminding me of my purpose and Emmy is a humbling reminder what He has given me must be shared with others so that they in turn may pass along His blessings.